Other concerns remain despite better conditions. Andrew Loh. “Very decent living. You can call it the six-star dormitory for workers,” Mr Eric Tan, our guide, told us when The Online Citizen visited the latest in dormitory living. “But for us, we’re not used to it,” Mr Tan added, as he showed us around the property. Avery Lodge is an “upmarket” dormitory with a difference, not unlike a mini-HDB estate. 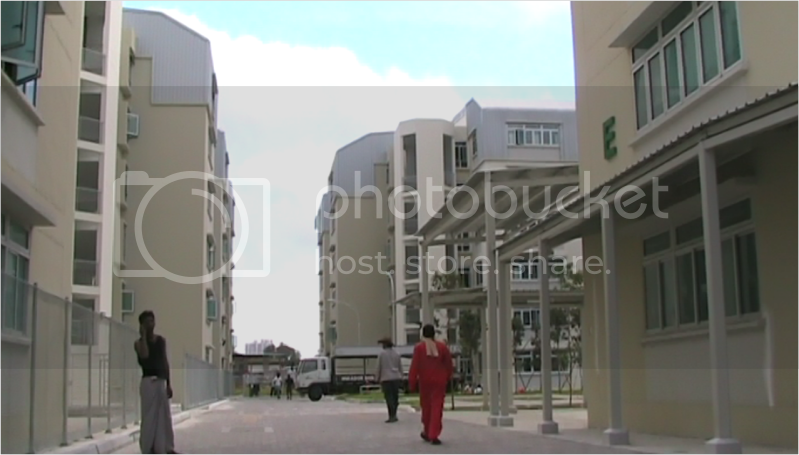 Built on a two-hectare piece of land in Jalan Papan, Jurong Industrial Estate, the five-building dormitory has capacity to house 8,000 workers in 486 units. Each unit comes with its own living room, dining and kitchen areas, besides the sleeping quarters for 16 to 18 men. The compound has a gym, a sick bay, a canteen and a minimart which sells fresh foods such as fish and vegetables. Security guards man the entrances and exits points. “This will be a relatively upmarket dormitory, with bay windows, more generous floor-to-ceiling heights and space per worker, and amenities,’ said Mr Vernon Chua in an earlier interview with the Business Times. Mr Chua is the managing director of Averic Capital Management, which is the asset manager for the venture and which holds a 3 per cent stake in Avery Strategic Investments. Morgan Stanley Real Estate-managed funds hold the remaining 97 per cent. When TOC visited Avery Lodge on 15 March, we were told that it was currently “80 per cent occupied”. The compound is impressive. It feels and looks like a brand new HDB housing estate – with five 6-stories buildings. There are open courtyards, parking lots and exercise corners for the workers. More impressive are the housing units. The living room is air-conditioned, which provides relief from the heat outside. It has a sofa, a LCD television set, a tv console, blinds on the windows, a dining table and chairs – and tiled flooring, something we haven’t seen in any of the dormitories we’ve been to. Impressive indeed. 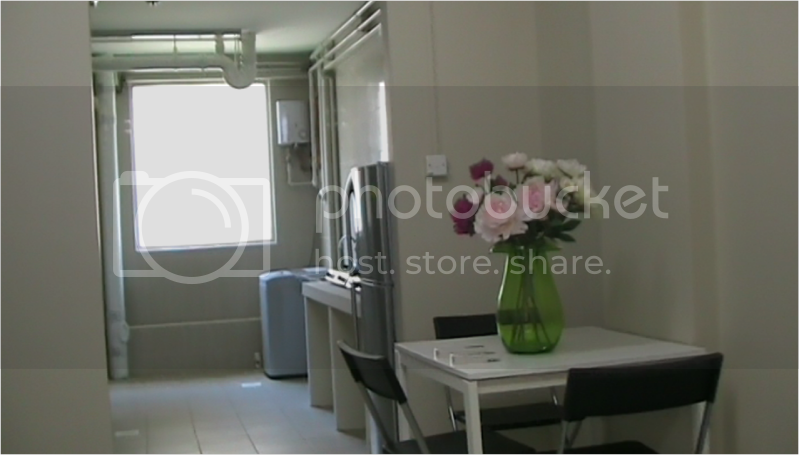 There is a washing machine in the kitchen area, along with a refrigerator and two cooking stoves. There are two toilets and two shower rooms. The single bedroom, where the men would sleep, also has an air-conditioner and lockers, another rarity in workers’ dorms, for the men. Avery Lodge is indeed a world away from the unhygienic, run-down and dilapidated dormitories we had seen elsewhere in Singapore. Shelley Thio, volunteer with aid group for migrant workers, TWC2, was cheered by what she saw. However, when probed further, Mr Tan told us that the unit he was showing us was only a show flat. In the actual living quarters for the workers, there are no air-conditioners. Neither are there LCD television sets, nor tv consoles, or blinds for the windows. There are also no washing machines or refrigerators, no ceiling fans. And the tiled floors? The two rooms we were shown had no tiled floors. In short, the actual living quarters for the workers would consist of the bare minimum. The employers of the men would have to bear the expense and responsibility of fitting and furnishing each unit accordingly. We asked to view the units where the workers are already living in. Mr Tan obliged after he had made a phone call but not before telling us that no videos or pictures are allowed to be taken of the units with the men. This was in sharp contrast to the freedom we were allowed in snapping pictures and recording videos of the show flat. He also tells us not to be “shocked” by what we might see. 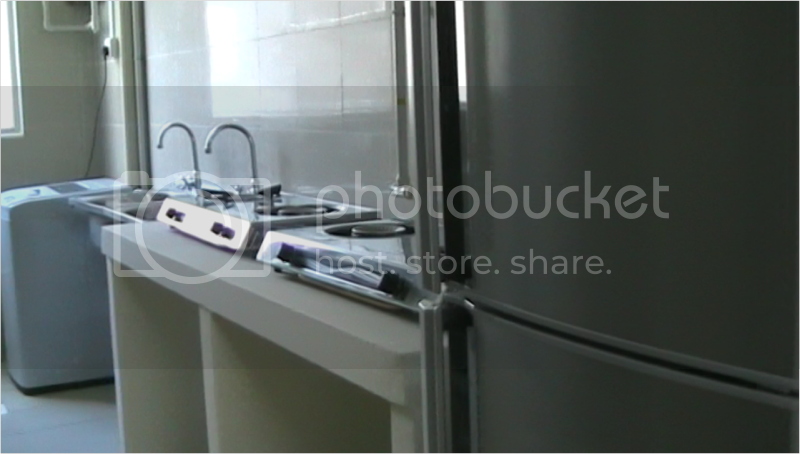 We are then taken to 2 unfitted and unfurnished units. The occupants are Burmese workers. 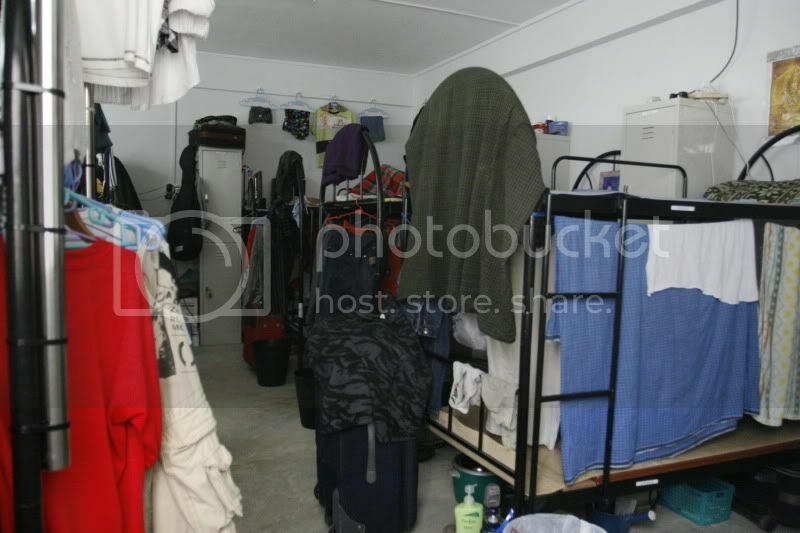 In each of the two units, there are 9 double decker beds in the only bedroom, 8 to 10 rice cookers (multi-plugged system and logged into one electrical socket in the wall) on the untiled floor in the living room, several fans randomly placed around the unit and 2 gas cook tops in the kitchen. Perhaps because of the lack of locker space, or bad personal upkeeping habits, the rooms are messy with clothes hanging everywhere, and personal effects strewn on the floor. Foodstuffs are also kept in the rooms. There are flies in the kitchen area and trash which have obviously been there for a while. The air smelled stale perhaps because of the lack of ventilation. There are no ceiling fans. When asked how often inspections of the units are carried out, Mr Tan replied that it is done once every three months. One worker, who approached us, said that the situation was very bad and that he disliked it there. Avery Lodge is perhaps a glimpse of the future of housing for migrant workers who have come to work in Singapore. And in all fairness, the property is of acceptable standards. Having said that, however, there are concerns which may not have anything to do with the property itself but which are just as important. Avery Lodge houses 8,000 workers from various different countries, speaking different languages. One wonders how instructions are passed to them by the operators of the compound. When asked if there is a clinic for the men, Mr Tan said there is a sick bay. We did not get a chance to view the sick bay as it was still being set up, we were told. How many beds would there be? What kind of medical care, if any? Who will staff the bay? What are the procedures for any medical emergencies, given that the property is located deep inside an industrial estate? 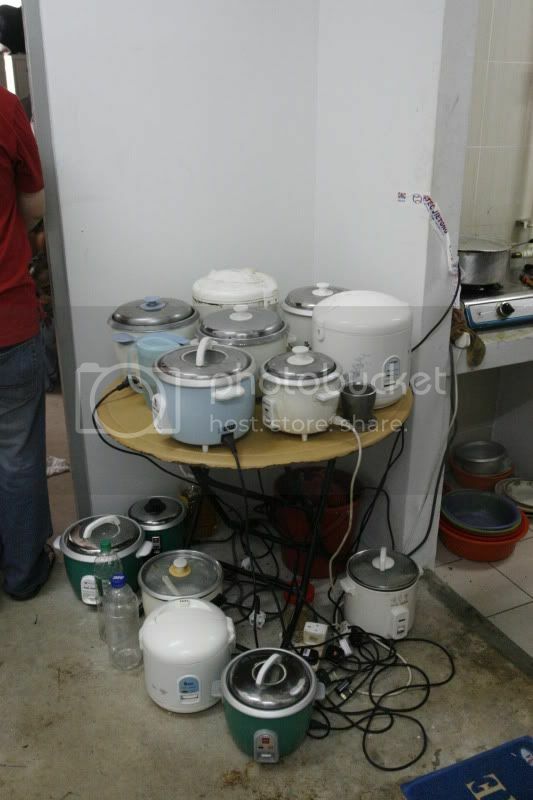 The workers use multiple rice cookers – in one of the units, we saw 14 rice cookers – and plug these into one same multi-sockets adapter, potentially overloading the capacity of the electrical socket. Couple this with the workers’ tendency to have things strewn all over the place, a fire outbreak is not unthinkable. An inspection of the units only once every three months may not be appropriate. On the same note, are fire drills conducted to familiarize the workers should a fire break out? Hygiene is perhaps the most important thing to teach the workers. For example, workers should be taught why it is important for them to clear their trash daily instead of keeping it in the quarters. 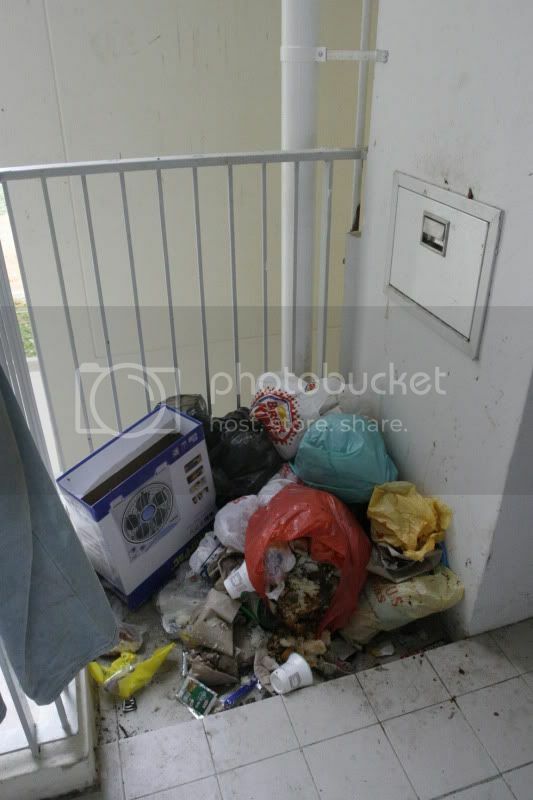 When we visited the unit on the second level, we saw a pile of huge garbage laid out in a corner of the corridor. The trash was a few days old and there were houseflies hovering all over the garbage. As informed by Mr Tan, Avery Lodge is presently housing 5,000+ migrant workers and with so many people, it’s only fair to assume that they are going to generate a lot of trash. How often does Avery Lodge organise trash to be cleared on every floor? Or is this left entirely to the workers themselves? Avery Lodge needs to conduct regular educational programmes for the workers. If a worker has a complaint, who does he turn to within the compound? The nearest bus-stop is a long way out. Where do the workers go during their off days and how do they get there? How would the lower-paid workers be able to afford the rental of $180 per month? It would be one-third or more of their salaries. We were part of an invited group to view the compound, which has guards watching the comings and goings. Who will have access to these closed-quartered dormitories to conduct regular and independent inspections and to have access to interview and speak to the workers about their living conditions? To conclude, while providing migrant workers with decent lodgings is to be applauded, even if they are commercially-run dormitories, perhaps we should look beyond just dumping these workers in such compounds. We need to look at the other aspects of dormitory living as mentioned above.